A true superhero knows when to boldly charge into battle and when to delay your game for a couple of months in order to make sure it's solid. And that's just what Champions Online developer Cryptic is doing. Originally slated for a July 14th release, the developer is delaying the game until September 1st, in order to "implement certain features". "It is critically important for an MMO to be as good as it possibly can be at launch. Through our constant dialogue with our vocal and supportive community of beta testers, we quickly realized that in order to implement certain features that we all considered important the development of Champions Online would require more time. So that's what we're going to give it. 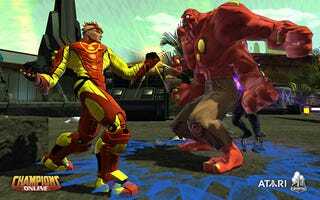 Cryptic has a proven track record of releasing solid games and we want to maintain that with Champions Online." So basically, they don't want to release the game until it's finished. Seems fair enough.